Only a few cities in Europe offer the historical and cultural variety as the Czech Capital Prague. The tradition of music lives not only in the many concert halls of the ‘Golden Town’, but also on the roads and in the pubs. Smetana, Dvorak and Mozart have coined Prague musically; today this tradition is continued by composers as Jaromir Vejvoda and Frantisek Kmoch. The Advent Prague is organized since 1999 without interruption by music&friends™ for Czech and foreign choirs and music groups. 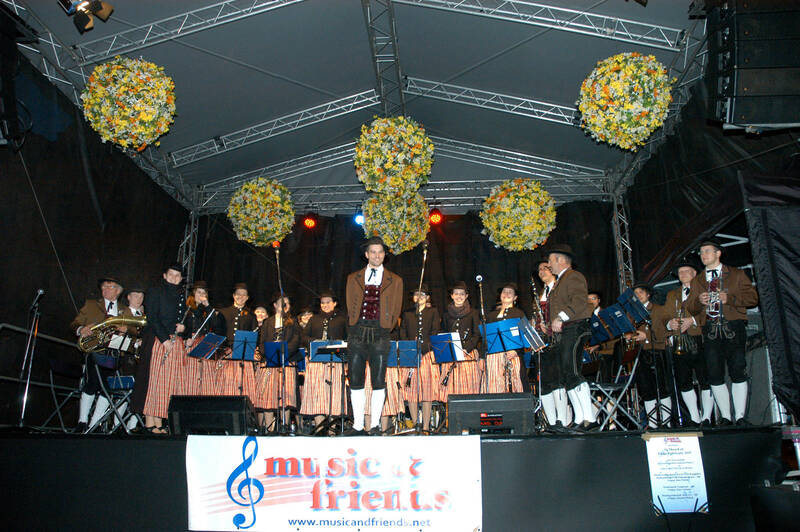 All performances for music groups at the most important Christmas market on the Old Town Square in Prague are organized at the weekends by music & friends™. 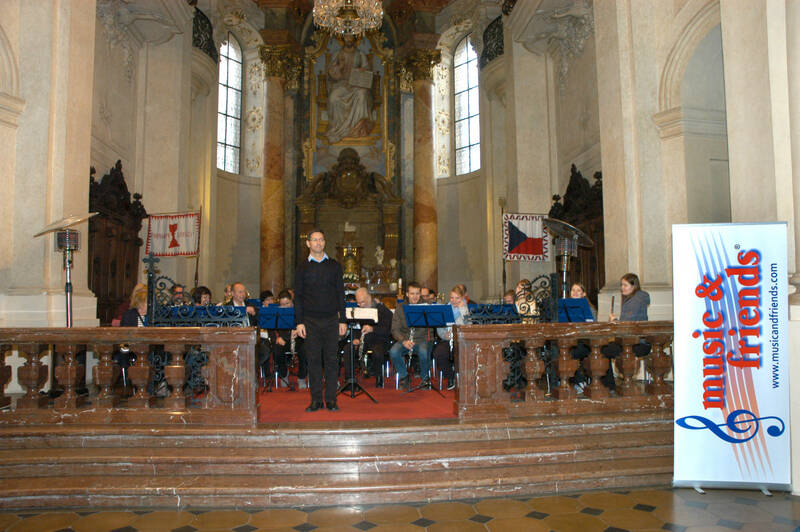 Many music groups have participated several times in Advent Prague in the past years. At one of the most beautiful squares in Europe, the Old Town Square, there is most beautiful Prague open-air stage at the Christmas Market. Locals and tourists come on Advent weekends to listen by choirs from all over the world. Heated waiting containers, presentation and a professional sound system are available. 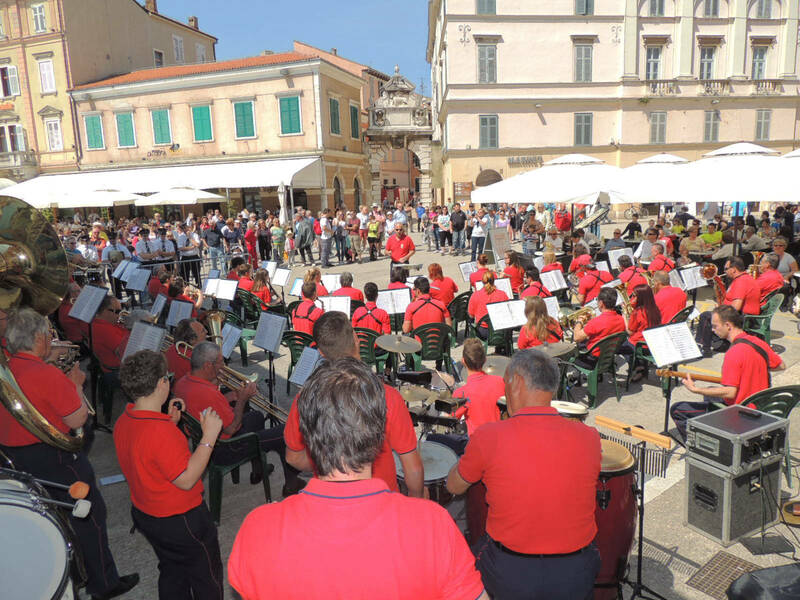 Concerts for music groups are organized in the St.-Niclas-Church at the Old Town Square too. Day 1: Arrival in the hotel and dinner. Day 2: Guided tour in Prague Castle (Hradschin). In the evening concert in a church. Optional in the evening dinner cruise at the Vltava River (Moldau). Day 3: In the morning guided tour in the Old Town or Jewish Quarter. Individual lunch and time for shopping. In the afternoon open-air concert at the Christmas Market, followed by a Bohemian farewell dinner. The coach must be available for all necessary transfers at the event. Possible, because all transfers can be done by public transport. The next airport is Prague (PRG). Local transport for all transfers can be arranged by music&friends™ or by public transport. There are many flight from all over Europe to Prague. With only 2 nights in Prague, the possibilities for individual sights and the number of performances are very limited. You can find the services and costs for the short stay in the detailed description, which you can order with the link down. You can order detailed descriptions of the various events free and without obligation at the following link: Descriptions The description will be send as a PDF-file by e-mail. Nowhere in Germany can you find such a lot of beer gardens and large brewery restaurants as in Munich. Here meet the local people and the visitors, enjoying their Bavarian beer and a small meal. Music is part of this culture, but only live music. The October Fest is the big show, but the real life you can find in Munich and all over Bavaria during the rest of the year! Already since 1950 the Beer festival in the municipality Olching nearby Munich is organized and opened with a parade through the town. At the parade approx. 40 associations of the city are taking part and are accompanied by marching music bands and majorettes. The parade moves about 2 km through the city centre to the area of the beer festival; after the parade, the festival is opened by the Major, who taps the first beer barrel. At further dates similar beer festivals are in other parts of Munich or in smaller towns around Munich. The beer festival season starts in May till the mid-September, when the October Fest starts. Concerts in large brewery restaurants and beer gardens in Munich brings directly contact to the music-loving public. Nowhere else in Germany does such a large part of life take place in beer gardens and restaurants as in the Bavarian capital. Enjoy the rustic atmosphere that attracts millions of visitors each year! A one hour drive southern of Munich, in the idyllic countryside in front of the Alps, there are several attractions like the castle Linderhof, the village Oberammergau with its famous festival and the Monastery Ettal. Concerts are possible e.g. in Oberammergau during the weekends and the music groups will meet a very typically Bavarian idyll at this place. Day 1: Arrival in the afternoon and check-in. Participation at an opening parade for a folk festival in Munich or surrounding. Evening in the beer tent. Day 2: Drive to the pre-Alps and guided tour in Neuschwanstein and the baroque Wies Pilgrim Church. Concert in the late afternoon, dinner and drive back to Munich. Day 3: Guided tour in Munich. In the afternoon concert in a beer garden. Dinner in a well-known restaurant in the center of Munich. The bus must be available for all transfers. Depending on the arrival on the 1st day, the driving time of the bus driver is limited in the evening. The way back from a folk festival might be done by public transport or with a local bus, organized by music & friends™. Not recommended, as large parts of the program require a bus rental, which negates all possible cost benefits of traveling by train. The next airport is Munich (MUC). Local transport for all transfers can be arranged by music&friends™. The rental of big music instruments, e.g. drums can be arranged by music&friends™. With only 2 nights in Munich, the possibilities for individual sights and the number of performances are very limited. You can find the services and costs for the short stay in the detailed description, which you can order with the link down. As hunting deer in 1348, the Emperor Charles IV discovered here hot springs and he couldn’t image the great success he had succeeded. The golden age of Carlsbad as one of the finest European spas has been in the 19th century. Carlsbad today is the first place in terms of cure in the Czech Republic, the pearl of Bohemia, unique, lively and charming architecture. In addition to spa buildings, colonnades and pavilions in the Empire or Art Nouveau style completed 1737 the Baroque Church of St. Mary Magdalene by Kilian Ignaz Dietzenhofer, the most valuable historical building. One of the oldest hotels in Central Europe is the traditional Grand Hotel Pupp. Marianské Lázně (Marienbad) is another world-famous health resort in Western Bohemia. The spacious park in the spa quarter and the large colonnade are a striking landmark together with the Singing Fountain, which presents every 2 hours water games with classical music. 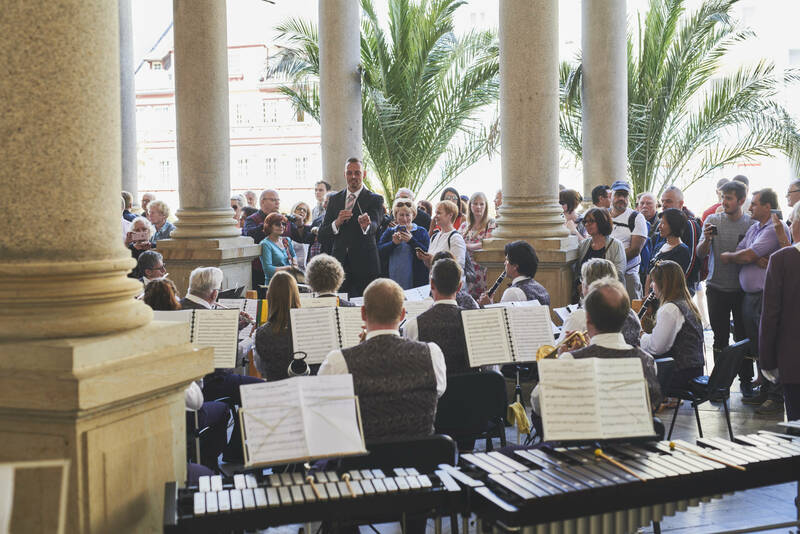 The performances will be in the colonnades of Carlsbad and Marienbad (Marianske Lazne), where the spa guests are walking around, drinking the mineral water from different sources. Another concert venue might be the 3rd spa town, named Franzensbad (Frantiskovy Lazne), near to Carlsbad and only a few kilometres from the German border. The music pavilion in the spa park is a very nice place for concerts. Each music group will get an individual itinerary - here you see an example for the stay. Short stay with 2 nights possible, if the arrival will be at noon of Day 2. Day 1: Arrival in Carlsbad, welcome drink Becherovka and dinner. Day 2: Guided tour by walk in Marienbad (Mariánske Lázne) for about 2h. Individual lunch. Concert in the main colonnade in the afternoon. Day 3: In the morning guided tour in Carlsbad. Taste the different mineral springs. 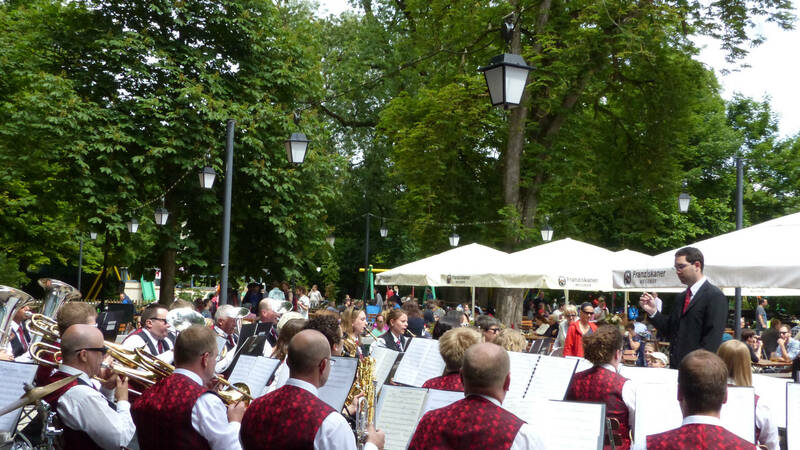 Individual lunch, In the afternoon concert at the Millspa-Colonnade (Mlýnská kolonáda) and parade in the centre of the town. In the evening optional farewell dinner with music. Day 4: Breakfast buffet in the hotel, check-out. With a later departure e.g. guided tour in the Museum of Jan Becher, the Distillery of Becherovka, called as 13th spa of Carlsbad. The bus must be available for all transfers. The next airports are Prag (PRG) and Dresden (DRS). Local transport for all transfers can be arranged by music&friends™. The rental of big music instruments, e.g. drums can be arranged by music&friends™. The Catalan metropolis of Barcelona belongs to the premier league of European cities and combines history and tradition with modernity in a harmonious way. The 2000 years of history led the city into a cultural and economic centre of the entire Mediterranean region; his worldwide fame reached Barcelona by hosting the Olympic Games in 1992. The variety of cost flights to Barcelona and Girona make the journey easy. Sightseeing in Barcelona round off your stay within late-summer temperatures. Optionally, the accommodation takes place in the centre of Barcelona or in cost-favourable hotel on the Costa Barcelona; all hotels are classified in the 4-star category. Performances of the music and folk dance groups are open-air in Barcelona on a busy square, e.g. in the Spanish Village or in the area of the Olympic port. Audience are locals and tourists. Another peformance is in a historic village on the Costa Barcelona or the Costa Brava. On a central square in the center of one of these towns, it will be possible to get an impression of the everyday life of the inhabitants. Each music group will get an individual itinerary - here you see an example for the stay. Day 1: Arrival at the hotel at the Costa Barcelona and dinner. Day 2: Tour to Barcelona and guided city tour: Olympic harbour, Montjuich and the Ramblas. Performance open-air and time for individual sights. Tour back to the hotel and dinner. Day 3: Tour along the coast with charming towns and villages. Performance at the main square in one of these towns and tour back to the hotel. The coach must be available for all necessary transfers at the event. The coach driver will be within his limit of driving time, but has to drive every day. Not recommended because for many transfers local coaches are necessary. Only with accommodation in Barcelona transfers can be arranged by public transport. The next airports are Barcelona (BCN) and Girona (GRO). Local transport for all transfers can be arranged by music&friends™. Extensions at the coast side for relaxing or individual tours to Barcelona are possible. Or to have a full day excursion to mountain Montserrat with the Benedictine monastery of Santa Maria (about 60 km from Barcelona). Famous is the statue of the Black Madonna, patron saint of Catalonia. The figure of the 12th century thrones above the high altar in the basilica of the monastery. Visit of y wine yard and tasting wines before the return to the hotel. Istria was and is again one of the most popular vacation regions at the Mediterranean Sea. History, culture and sun are combined here in an excellent way. One of the oldest cities and well-known also outside the country: This is Pula with the famous Romanian Amphitheatre, one of the largest at its time. The ancient port city of Rovinj, spectacularly located on a peninsula, is now one of the hotspots in Istria and a meeting place for many events. Istria is a wonderful frame for a choir exchange, when the hot temperament of the Balkans jumps over to the participants! Enjoy at the most beautiful time of the year with a boat trip and many other tours, or with extensions in Trieste or Zagreb. Concerts are open-air in the pedestrian zone in Pula and open-air or in a concert hall in Rovinj, the famous fishing village about 30 km north of Pula. Many listeners - both locals and tourists - are a grateful audience. Day 1: Arrival in the evening and dinner in the hotel. Day 2: Guided tour in Pula. Performance in the afternoon in the pedestrian zone in Pula. Dinner in the hotel. Day 3: Drive to Rovinj and guided tour by walk in the centre. Individual lunch or boat trip. Performance in Rovinj at th elate afternoon or evening. Farewell-Dinner with other music groups. Next airports are Pula (PUY), Trieste (TRS) and Zagreb (ZAG). Local transport for all transfers can be arranged by music&friends™. In the last years, many airlines started with direct connections to Pula, e.g. Norwegian. This makes it easier to arrange a stay with some private time for relaxing or rehearsals. Any stay with 2 nights is only possible with a short drive to Pula, e.g. from Austria. The program starts at Friday afternoon! Music groups with a longer stay may choose several extensions offered by music&friends™: Extensions with accommodation and guided tours in Istria or extension in Trieste or Zagreb. Only few European cities offer a historical and cultural diversity like the Bohemian metropolis of Prague. The tradition of musicality lives here in the many concert halls of the Golden City, on the streets and in the pubs. 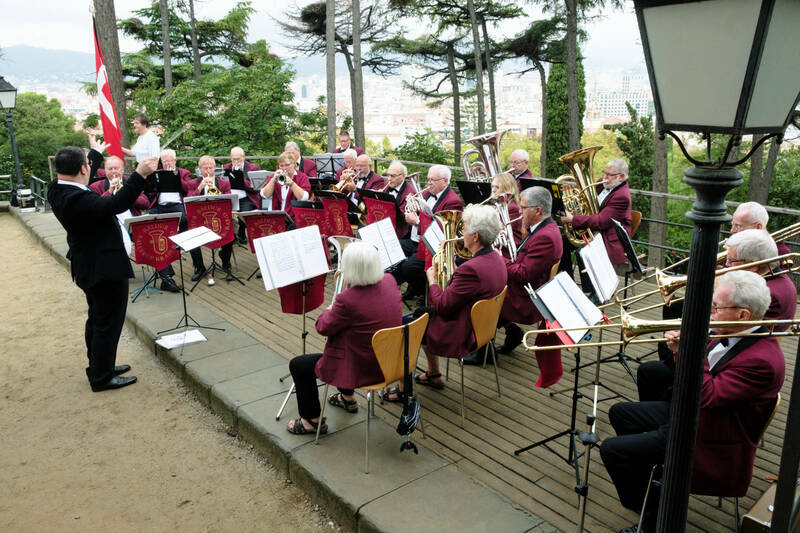 Bohemian brass music is known worldwide and characterizes the intense musical sensations of Bohemia and Moravia, where a musical education still enjoys a high priority. Prague is one of the most popular cities in Europe, where internationality and Bohemian coziness coexist side by side. There is an open-air stage on one of the most beautiful squares in Europe, the Old Town Square in Prague, in the midst of a colorful Easter market with painted Easter eggs, Bohemian glass and costume jewelery . Prague is full of visitors and tourists on weekends, in order to get into the mood for Easter and to listen to music groups of different styles from all over Europe or to enjoy folk dances. It is also possible to participate at a parade through the historic old town with marching bands and majorettes. The parade will take you through the most beautiful part of Prague's Old Town or through the Parisian street with the city's most exclusive shops. Basic drum set, 30 music stands and chairs are available. Hire of large musical instruments (such as timpani) possible; Cost on request. Each music group will get an individual itinerary - here you see an example for the stay. Short stay with 2 nights possible. Day 1: Arrival in the evening. Dinner in the hotel. Day 2: Guided tour at the Prague castle. Tour to spa Podebrady and performance in the spa centre, optional boat tour at the Vltava River in Prague. Day 3: Guided tour in the Old Town in Prague, perfprmance at the Easter Market at the Old Town Square, Bohemian dinner. The national holy of the "Green Island" is St Patrick. His name day is for the musical Irish one of the most important holidays all over the year. Parades in most towns all over the country, music and celebrations around the clock - it’s like Carnival and Oktoberfest at the same time. The Irish capital Dublin is one of the most dynamic cities in Europe. Investors from all over the world provide for a boom, which nobody could image a few years ago. Invariably typically is the old part of town, the Temple bar, which presents itself with innumerable restaurants and Pubs, where the nights are very short and where you can find a lot of temperamentally people. The participation at the main parade in Dublin requires a long-term selective procedure and a very high quality of the music group. We can offer however the participation in parades in suburbs of Dublin and in cities in the surrounding to the metropolis, which may give you better contacts and impressions of the country as those in the large city Dublin. Another concert venue is in the old Guinness storehouse, today Ireland's number one visitor attraction, providing an unforgettable welcome and a magical journey deep into the heart of the world famous Guinness. ♫ A DVD (not older than 1 year) with a performance of the group, alternatively a YouTube link is also accepted. ♫ A photo of the group in the uniforms they would be wearing during the parade. March 16: Flight to Dublin and welcome at the airport. Transfer to the hotel by private coach. Dinner in the hotel. 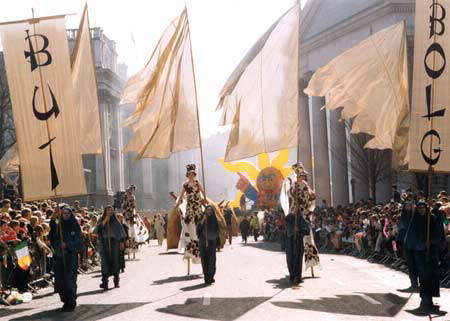 March 17: Transfer to the starting point of the parade in Dublin or in one of the towns around Dublin. Participation at the parade and transfer back to the hotel in the late afternoon. March 18: Guided tour in Dublin including the visit of the brewery Guinness at the St. James Gate in Dublin, the biggest brewery for Stout’ in Europe. A visitor centre shows the history and production of the brewery. Of course, you will taste a freshly drawn Guinness there too. March 19: Transfer to the airport or extension with a round trip. An alternative is to travel by bus to the Atlantic coast and to take a ferry trip from Le Havre to Southern Ireland. As the ferry trip takes 72 hours, cabin booking is necessary and this increases the travel costs on a higher level as flight costs. But on the other hand this solves the transport problems with large instruments. Next airports are Dublin (DUB) and Cork (ORK) in the Southern part of Ireland. Transfers to the hotels and for the complete program can be organized by music&friends. At the page “service” you can find some remarks regarding flight bookings and some links to airlines; please note that they might change flight destinations during the year. A problem might be big music instrument. Some carriers ask for a special fee to take them into the cabin; or for a specuial fee to transport them with the plane as baggage. And if there should be less space in the baggage area, they might ask to send them as fright. The name of Jaromir Vejvoda (1902-1988) and his composition "Škoda lásky" (Beer Barrel Polka) is the success history of the Bohemian brass-band music. 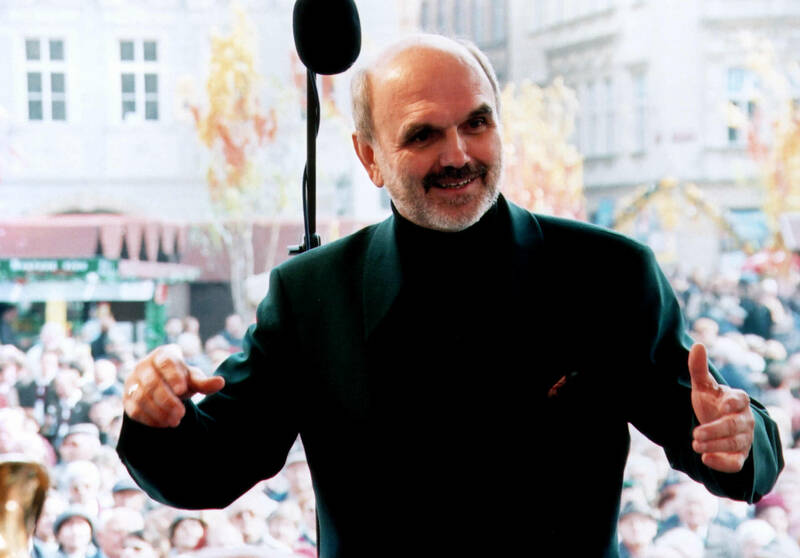 Besides this world success, the most played Folk music song of the 20th century; Jaromir Vejvoda has composed another 79 songs (polkas, waltzes, marches and tangos). The musical inherits of the composer is managed after his death by his three sons. The youngest son, Josef Vejvoda, continues the musical tradition of the Vejvoda Family as composer, arranger and musician and as conductor of the Vejvoda Band and the Salon-Orchestra Josef Vejvoda. He already has played as a child in the band of his father and leads these workshops in English or German. These workshops arrange the original interpretation of the composer on the basis of the original arrangements in 4 lessons à 1.5 hours. During the lessons, attractive sightseeing in Prague will be offered for the companions in the group. A concert is the final highlight of the workshop; Josef Vejvoda will conduct the compositions of his father and after this the band presents a musical program from its region. Dates of these workshops (from Thursday till Sunday) can be chosen individually. The detailed description contains and includes accommodation and meals. Within a few days you will get the confirmation for a spectacular way to learn the success of the Bohemian brass music. Day 2: For musicians: Two lessons with about 2h with Josef Vejvoda followed by the delivery of a Vejvoda-certificate. In between guided tour in Prague. For companions: Guided tours in Prague: Old Town and Prague Castle (Hradschin). Day 3: Free for shopping or additional guided tours, e.g. New Town or Lesser Town below the Prague castle. In the afternoon drive to the spa of Podebrady in central Bohemia and the seat of the 1st Bohemian King Jiri. Concert in the spa center.